Due to popular demand, and to an impending nervous breakdown fom a reader whose sharp mind I'd like to retain, there will henceforth be no more "anonymous" posting. I WILL NOT KNOW WHO YOU ARE, AND I CANNOT BLOCK YOU FROM POSTING, SO YOUR IDENTITY IS SAFE. JUST PICK A NAME, ANY NAME. PLEASE. FOR THE LOVE OF G-D! I understand that the signup process may take 2 minutes, but if you can post on the blog you can find those 2 minutes somewhere. I would prefer that you sign up with blogger, and choose a username and a password. That, however, is not mandatory, you can choose a screenname without signing up and divulging any personal information. Just choose it and stick to it. Sounds confusing? maybe, but I've got faith in y'all. During the war of 1812 The Alter Rebbe was again on the other side of the equation. Sounds Familiar, no? He and the Ropshitzer Rov were the only ones to "root" for Czar Alexander I. In short: The holy Reb Mendelle of Rimanov would appear to Napoleon and tell him of his forthcoming victory. 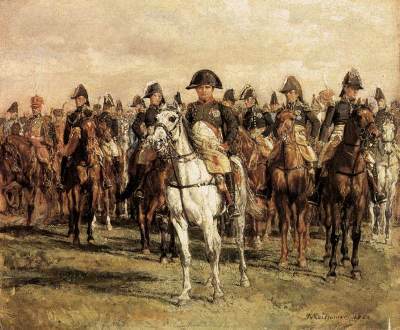 Until the battle of Waterloo, where he did not. Most other stories have sources such as The Munkatcher Rov zt"l in Darkei Chaim V'Sholom, yet this story has no source. Rather the source is the "Napoleon's Chronicles", whatever they may be. Your thoughts, whatever they may be, would be appreciated. As described in the words of Yom Tov Erlich, z"l.
די קינדער וועלכע זענען ווייט אוועק. I see that for some reason he blames the Haskoloh only, why no introspection? Why only sitting Shivah and tearing Kriah? Kovner Rov, א חסיד ? I don't believe I've seen other Litvishe Rabbonim with a Gartel like that. Maybe it's just a belt. Taken at an אסיפת הרבנים in Petersburg. Actually, he died from illness, but I mean in a spiritual sense. (כל המסובים עמדו והכריזו בהתרגשות: "הורע, הורע, הורע". ומיד לאח"ז פתח כ"ק אדמו"ר שליט"א ואמר את המאמר)]. Man, I wish there was a tape of that Farbrengen, but alas! Chassidim zenen klug, and they saw that this was an extraordinary event happening in front of their eyes, they seized the opportunity. The same or next day Stalin died. The news was only publicized days later, with the reports only being at first that he was "ill", and only later that he died. In Chabad they say the Rebbe "killed him". "מיר האבען אנדערע וועגן ווי דאס צו טאן"
So, according to RYTE his Rebbe "killed" him. So who gets the credit here? It seems like no matter how hard they try not to sound the same they all do. Take A CERTAIN KID for instance, his main beef is that he was told דו ביסט א גארנישט, something that for some reason doesn't bother most other people. Then again he's not just "other people", he's an "anarchist", brrr. When is some פרייאק going to come up with an original line, an original reason for leaving the fold? And of all communities CH is the least of your problems if you're in the mood of a good time. Please don't tell me that I don't understand either. 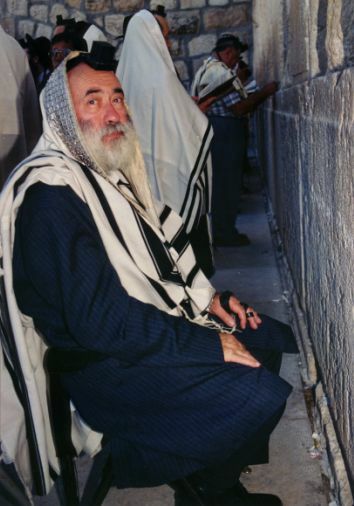 Reb Eli Chaim z"l at the Kosel. Notice the Atoroh. The Tallis and Tefillin are still Chabad, though. I guess it doesn't get any more Litvish than that! Rabbi Shimon Groner passed away last week. He was Leibel's first cousin, his father was Schneur Zalman. RSZG passed away when young Shimon was 14 years old, which was in 5706. My only question is why did he not join his cousins in Tomchei Tmimim? For that we'll need to learn more about his father which we do not know at this time. I saw his picture on the front cover of the Yated and decided to buy it. It was tough going through the pages, I tell ya. Was he related to Dov Groner who was killed al Kiddush Hashem by the British in 1947? Anyway, Shimon stayed in YRCB on Stone Ave. where he was "One of two Bochurim in the Bais Medrash on long summer friday afternoons, him and his young Chavrusah" (aren't they all?) and "never left". Even when he was away from the Yeshivah he took it with him. In 5738 he became Mashgiach, (after Rav Avigdor Miller left? 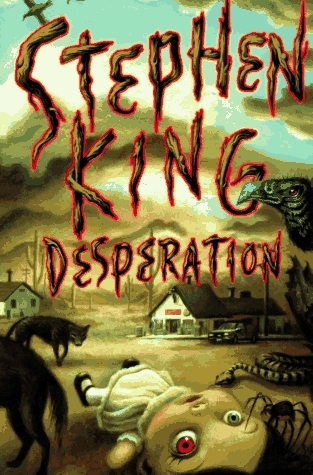 ), a position he filled until his untimely death. They did (the Yated) conveniently omit the fact that he was a descendant of Bais HoRav, altough they mention his father's name, but there they mention only that he learned in Eitz Chaim in Yerushalayim and that he was a "scion of the well-known Grossman family". He was also the only Bochur permitted by the Roash Yeshivah RIH to grow a beard. 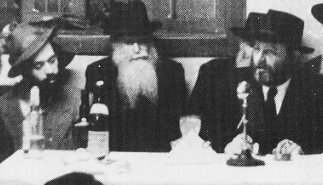 l-r: Shlomo Carlebach, Reb Meir Ashkenazi Rov of Shanghai, China, The Rebbe. The rebbe said a הדרן על הש"ס at the farbrengen. Bruria Hutner David, (1936 - ) daughter of Rabbi Isaac Hutner, is the current dean of Beth Jacob Jerusalem (commonly known as BJJ), a prestigious religious girls seminary located in Jerusalem, Israel. Known as Rebbitzen David, she was on one of the planes, along with her husband and parents, which were hijacked by the Black September terrorists in 1970. Dr. Bruria Hutner David received her doctorate in philosophy from Columbia University in 1971. Her dissertation dealt with The dual role of Rabbi Zvi Hirsch Chajes: Traditionalist and Maskil. Her dissertation demonstrates a thorough mastery of the source material, and deals with R. Chajes relationships both in the world of Haskallah as well as in the traditional world of Orthodox Judaism. She's molding the young, impressionable women of tomorrow, a Columbia grad of the 60's?! You get my drift here? Watch the interview with David Fakler. Now he's doing an interview with Sholom Ber Keller, a Yosom. The depths some people will sink to just to generate controversy or to get back at others is unbelievable. What's next, are we going to use one of the shnorrers in 770 as proof of the lack of helpful institutions in CH? Am I supposed to let that go too? 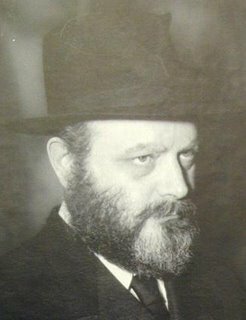 Most of you have heard about it, so here's the Jewish Week's take on the “Reaching for the Infinite: The Lubavitcher Rebbe – Life, Teachings and Impact” Conference held at NYU this week. Why couldn't they all be like him?! 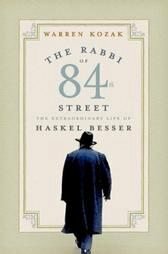 I've always admired Reb Chaskel Besser. 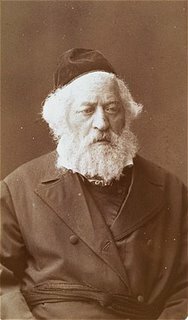 An old-time Peylishe Yid, a scion of a very distinguished family, he always seemed like the perect example of a Torah-diplomat who never allowed the young and even old Askonim and Rabbonim inflame passions amongst the Agudah faithful. He's a true treasure, and, unfortunately, today's so-called "askonim" have much to learn, with all due respect to their accomplishments. In the video soon to be released where people speak of their recollections of the Rebbe, he's the most fascinating personality to watch. His respect, reverence, and even love for the Rebbe, that's right, love, a true אהבה, is clearly evident. The Rebbe reciprocated and showed him the respect due to an Askan of his caliber. How then did the Agudah take the turn that it did, banishing Rabbi Soloveitchik (although he left and joined Mizrachi) and anybody that a certain Rabbi didn't like, and propping up and creating the new age Gedolim that we have in the Agudah today? Does he think that the Rosh Yeshivah of Philadelphia (may he have a Refuah Sheleima) really has his finger on the pulse of the Jewish People? Does the Rosh Yeshivah of Yeshivas Rabbeinu Chaim Berlin, a kid from the Young Israel of East New York, know how to take on the crises that befall Klal Yisroel? they book is available at EBAY and is a great read. Some great pics there too. My friend, blogger --------- (I forgot his name!) wants to know why we cannot along. After all, aren't we cut from the same Russian-Belorussian-Lithuanian cloth? we wear the same clothes, we speak the same language, and we both purport to seek intellectual stimulation, not feeling fulfilled by what the Tzaddik learns and does. I'll try to be coherent here, but it may take more than one thread. The truth is that I do have more in common (sometime) with a simple, Temimisdikke Yid, who learns in his free time and knows no חכמות . A man of esteemed lineage who wears extravagant clothing does not garner his respect, the man needs to teach Torah, and work hard at it. When I see the photos of two Rebbes sitting together in a lavishly furnished room with huge silver vessels filled with fruits and cakes, I can puke, sorry. The contrast is when we see 2 of the older generation Litvishe Roshei Yeshivos sitting in a simply-furnished room with Seforim all around. If I were to need to choose who to look up to and emulate the choice would be quite easy. So this Yeshivishe Yungerman who works for a living and spends his spare time learning, attending Shiurim, and mostly, not attending his Rebbe's einiklech's Chasunah twice a month is worthy of much respect and admiration. This was the case until the recent past, about 30 years ago. Since then the haters have hijacked the cause. 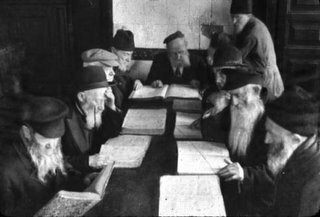 No longer was the way of life to just simply spend your time learning and spreading Torah, albeit to your community only. Somebody decided that their job was to be the policemen of the Jewish World, and to decide who can and cannot speak. They are the true "Torah Jews", only their Rabbonim and Roshei Yeshivah have Daas Torah, everybody else is either "krum" or is just ignored. The main problem with that is that most Baalei Batim today are products of those Yeshivos and Rabbonim and are exposed to the hate. Many, to their credit, do not soak it up, but many do, especially the "frummer" ones, which is problematic. They are not naturally the zealot type but they cannot help it. Years of hearing it in their shmoozes and at Shiurim have taken their toll. For those who see Lubavitch in action it may lessen the effect but it's still there. How then am I supposed to love them? Lehavdil, Indians and Pakistanis are also the same people, living in the same country and yet they hate each others' guts. I use them as an extreme example. We have been alienated. I'll admit that Lubavitch has no love lost for "misnagdim" and abuse the term terribly. Gone are the days where the Litvishe Rabbonim like Harav Moshe Feinstein and Harav Y.E. Henkin were the eyes of the community, they were true leaders who let old disagreements die. The Rebbe often differentiated between "Misnagdim" and "Nit-Chassidim", the aforementioned Rabbonim were the latter. Today's leaders of the "Torah Community" are not only of lesser caliber, which can be understood, we all are, but they seem to try and make up for it in other ways. The newspapers decide public policy and decide who's in and who's out. Sort of like one-big Moshe Sherer, z"l.
The general Chassidishe Velt deserves another post, I sometimes feel more distant from them than I do from the Yeshivishe, but that's for another time, hopefully very soon. I do not write מתוך שנאה but rather to clarify the issue. How is it that an unlearned, angry, depressed character like him can be sprouting opinions and formulating policy about our holy Rebbeim? Why should I "loz op't", like Berl says, and let him run rampant, totally unchecked? Does his mental and emotional status absolve him from any criticism? Let him ramble on about Art and Architecture, but leave Yiddishkeit and Chassidus alone! I am trying to be positive rather than just attack, attack, but some issues must be taken on directly. I do not act as an investigative reporter and try to expose Roshei Yeshiva etc, all I do is discuss, and let everybody speak freely. no mention of their religion here. "The violence — originally concentrated in neighborhoods northeast of Paris with large immigrant populations — is forcing France to confront long-simmering anger in its suburbs, where many Africans and their French-born children live on society's margins, struggling with unemployment, poor housing, racial discrimination, crime and a lack of opportunity." A Chosid once came to the Alter Rebbe "complaining" about his situation in life. "Rebbe", He said, "I am wont of both worlds, I have neither Olam HaZeh nor Olam HaBoh". Other Chassidim, Chassidim of Peylisher Rebbes, have it much better than I do. They travel to their respective Rebbe for Shabbos with their wives' permission, because she knows the Chossid will ask for Brochos of Gezunt and Parnossoh and will receive them. At the tish the Chossid gets Sherayim. At Yechidus the Chossid asks for everything he needs and the Rebbe graciously "pours" the Brochos. Of course, when the Chossid gets back home he is happily received by all of his family. After living such a spiritual life he merits a Gezunte Olam Habah because he's done all that's expected of a Chagas Chossid. The Chabadnik has none of this. His wife gives him a hard time. "you must ask the Rebbe for a Brochoh for Parnossoh, for our daughter who needs to get married" etc. He cannot do this. When he gets to the Rebbe he tries hard to understand the Maamar, he attends the Chazoroh, review, of the Maamar, he fasts before Yechidus, and when he gets to go into yechidus he cannot do it. He simply cannot bring himself to ask the Rebbe for Brochos regarding personal physical matters. The Rebbe asks him about his learning, davening etc. and he's ashamed. He leaves the Rebbe a broken man. When he gets home the wife asks him if he'd asked the Rebbe for the Brochos, he says no. Next year he'll have a hard time convincing her to let him go again. He remebers the Maamar and the lessons he needs to learn from them and he has a difficult time implementing the Rebbe's directives. When he leaves this world he's asked וואס פאר א חסיד ביסטו? So he says, A Chabadnik. A Chabadnik gets asked "Did you learn Chassidus, Did you daven like a Chabadnik should etc. He's left with no answer and is sent directly to h---. "איך וועל ניט בייטען דעם (חב"ד) חסידישען גהנם אפ'ן פויליש'ער גן עדן "
Well, not in Lubavitch but elsewhere. In Breslov it seems that some have gotten sick and tired of crazies giving their Rebbe a bad name, so they've taken action. They've basically decided that they've had enough of the crazies running around giving Reb Nachman and Breslov a bad rap. They wish to keep to themselves. They're mostly Yerushalmi Breslovers who never signed on to the idea of "opening" Breslov to the masses,so they've decided to stick to themselves and keep Breslov and all it entails to themselves. They do have an advantage though. They've had 200 years to develop ideas without a current Rebbe directing, they therefore can decide for themselves. They also do not have one Shul where everybody needs to daven other than on Rosh Hashanah. I was זוכה to get a Psak from him in the old Flatbush Eichler's. I was pestering the poor man, asking him for prices on half the seforim in the store. Hershel was a Mechanech for many years in the ערי השדה before starting the seforim business. A sharp Jerusalemite who became a successful businessman. In light of recent events, where every Russian, Minnesotian, and son and daughter of Baalei Tshuvah who was ever brushed against at a farbrengen or had his hat smashed at the Mikveh in Crown Heights is "exposing" Lubavitch, we need to reconsider our priorities. 1) The Russian bachelor who feels he's been lied to and Lubavitch isn't perfect, worse, they're a bunch of Hungarians who don't understand Greco-Roman Architecture, and only TNLR has the right idea. 2) The fool from Minnesota who feels that the Rebbe should've used his contacts to save Raoul Wallenberg, the Falashes, and the spotted owl, if not he should've died (r"l) with the rest in the gas chambers. 3) The young girl who's lost her way and now uses her feel-good education to make teenagers feel good and comfortable in an irreligious environment. 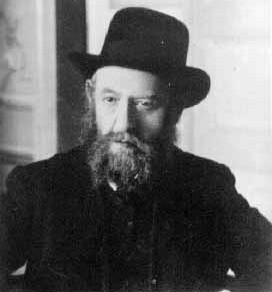 4) The Sefardim, Frenchies, American Baalei Tshuvah, without whom such troublemakers such as a Rabbi at a certain institute for Baalos Tshuvah would have nobody to preach to. THEREFORE, I PROPOSE A 10 YEAR MORATORIUM ON CHABAD OUTREACH ACTIVITIES. Meaning, no Boy or Girl, man or woman should be sent to a Yeshivah or Girls institute for the next 10 years. Chabad activities should be limited to doing mivtzoyim and/or teaching Nigleh only, preferably Artscroll/Metsudah/Feldheim. Anybody needing to go to Yeshivah should be sent to Aish or Or Someach. A person needing "Rebbe" guidance should be sent to one of the "Gedolim" such as Goldwasser and so on. The Rebbe nor Chassidus should not be mentioned. This will make it a better life and Lubavitch for all of us. 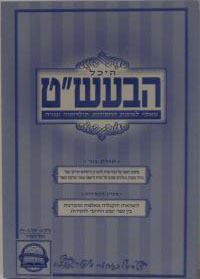 In the latest issue there are Zichronos from Reb Mendel Novikov, a Chossid who passed away in Eretz Yisroel in 5703. 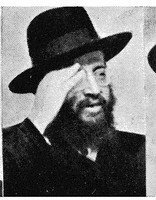 He writes: In 5699 Reb Levik Schneerson (later of) Yekatrinoslav stayed with me at one אכסניא in Lubavitch for Yom Tov (Shavuous). He ate the Yom Tov meals at the Rebbe's house. upon his return he told me that he had asked the Rebbe when was the Yohrtzeit of the Baal Shem Tov? The Rebbe replied on the first day of YomTov. Do other groups that have the mesorah as it being on Yom Tov Sheni also mention this? Is this why they say that he was Niftar on Yom Tov Sheni, so as not to be compelled to say that he wasn't buried by humans?